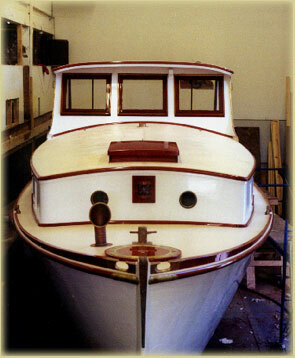 A well built boat that receives proper maintenance from her owner can last a very long time. This is particularly true of wooden boats as evidenced by the number of these boats that are still serving their owners well after 30, 40, and even 50 plus years. An advantage of boats constructed from wood is that if one or more of the structural components requires attention, (a plank or frame, for instance) these can be repaired or replaced as needed. In theory, a wooden boat can go on forever for this very reason. We work closely with our customers to ensure their boats are properly maintained and seaworthy. This can be as simple as providing annual systems checks and painting or as comprehensive as a keel-up restoration. We also work with our customers to develop an ongoing maintenance/repair schedule with the mutual goal of catching and addressing relatively minor issues before they become bigger problems. All restoration and repair work that we do is available on a time and materials basis and you'll be happy to know that we have some of the most cost effective yard rates in Maine. We welcome the opportunity to care for your boat, whether it involves regular maintenance, repair or a complete restoration. Please feel free to contact us to discuss your specific requirements. The images below are representative of some of the restoration and repair projects we've undertaken for customers over the years. To view additional photo's and descriptions of the work carried out on these boats, click on the relevant photo. "CHAUTAQUA" "JULY CALLS" "NOMAD" "TARA"